The motion sensor distance is mistakenly written in user manual (10M), the actual distance is 5M /16 feet. Before installing the solar light, it’s recommended to test it under a dark place so you understand which mode you have chosen. 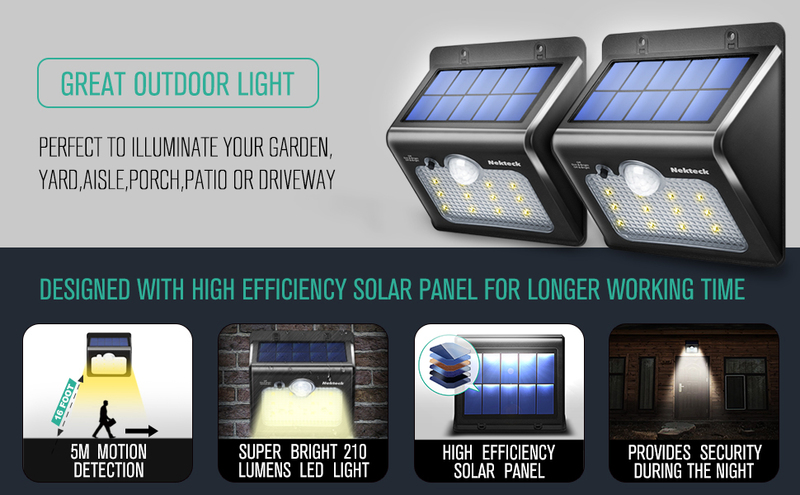 The Nekteck Solar Powered Garden Wall Light is designed to illuminate your outdoor walkways, dining areas and decks while adding extra security to your home and taking advantage of solar energy. 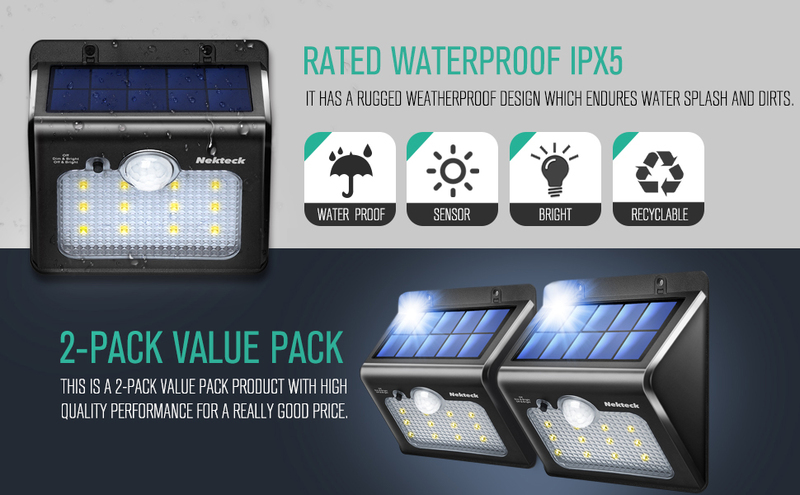 These solar lights feature high efficiency solar panel with 210 lumens of light for longer working time and super bright LED lights. It’s designed to be water and dust proof so no worries about the weather damaging the unit. These motion sensor solar lights can detect motion up to 10 meters in distance with 2 modes to choose from which is really awesome. The LED bulb need not to be replaced and will remain cool to the touch at all times, providing safe lighting that will not heat up or get burned. It’s wireless and super easy to install on the wall using the supplied screws in the package. These solar powered lights just don’t help you save energy but also provide security. How awesome is that? This is not just a want but a need! Not tomorrow, not next week, but NOW! Here are some FAQ’s to help you better understand how this solar light works. • The light has two different setting, which one should I choose? Off/Bright Mode: the light will be on with max brightness when motion detected and off when no motion. Dim/Bright Mode: Light will turn on as dim mode at dusk and max brightness when motion detected. the light will be forecd to turn on when you adjust the setting, leave it there for about 20 seconds and it will work as the mode you choose.